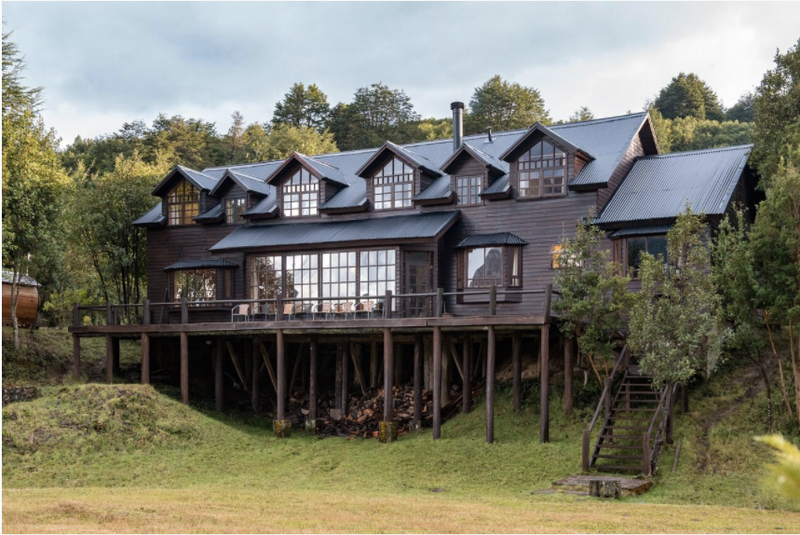 Eleven Experience will open Rio Palena Lodge in Chilean Patagonia in February 2019. Located in a remote valley and nestled against a lush green hillside on the banks of the magnificent Rio Palena, the lodge will offer guests the ultimate fly-fishing adventure and a chance to truly switch off and disconnect from modern day life. Sleeping up to 8 guests in 7 en-suite bedrooms, Rio Palena allows guests to fish directly from the front door, in a region that is famous for large brown and rainbow wild trout. These special super- charged trout thrive in the glacial waters of the myriad lakes, rivers, and streams in this far-flung and remote part of Patagonia. With Eleven’s superb team of highly professional guides and experience managers guests of all ages and skill levels will be encouraged to join in the fishing adventures. Patagonia is a bucket list destination for anglers – a truly remote and pristine landscape with stunning wild scenery, Andean forests, snowcapped volcanoes and mountains – the region has a vast river system with plentiful strong and powerful fish. Rio Palena Lodge will offer anglers of all abilities a fishing trip of a lifetime, from tranquil float and wade fishing to exhilarating helicopter fishing, there is something for everyone. The Rio Palena is one of the best rivers in the world for large brown trout, and Eleven’s highly qualified, professional and enthusiastic guides know each stretch of the river, plus they are experts on the regional waters; and will ensure that guests are fishing the best water during the time of their trips. Rio Palena Lodge offers guests numerous sections of the Rio Palena for full and half-day trips – each with a variety of challenges and surprises, accessed by wading, rafts, drift boats or Hyde motorised Power Drifters. The region’s trout average 14- to 20-inches, with fish between 20 and 24 inches caught most days – and it’s not uncommon for 25 or more fish to be caught in one week. For those that enjoy classic float fishing guests can fish the upper Futaleufu River with classic riffles and runs that sweep over swaying aquatic grass. On the upper section of the river guests will fish through a series of islands and long placid runs and pools, ending in Lake Yelcho. Here, a jet boat will whisk anglers to reed-laden bays and inlets to cast dragon fly and beetle patterns to cruising trout. For the serious adrenalin junkie angler, a day of helicopter fishing will put guests on water rarely fished, including the renowned Lago Palena and the mystical Lago Caesar. Set in 13 acres, right on the banks of the river, the casually elegant Rio Palena Lodge has been newly remodelled and designed in Eleven Experience’s signature style. The relaxed design of Rio Palena Lodge is perfectly in keeping with its surrounds, offering guests unparalleled Eleven service and seriously comfortable accommodation. The 7-ensuite bedrooms, with king or double beds, each has a stunning view of the valley. The lodge’s private chef will prepare a delicious breakfast to set guests up for a day on the river, sending them off with a packed lunch, drinks, snacks and local wine to keep energy levels up throughout the day. Evenings are spent by the wood-burning stove or on the deck overlooking the river enjoying fine Chilean or Argentine wine. Guests can also relax in the wood-fired sauna and hot-tub. Gourmet dinners include local beef, homemade pasta, salmon and locally grown produce or a special Chilean asado – a BBQ accompanied by fresh salads and home baked bread. In addition to the main lodge, Eleven has two fully decked-out riverfront outposts on the lower Futaleufu River and in the Rio Palena Canyon. Each outpost provides a secluded haven for quick access to magnificent stretches of the Futaleufu and lower stretches of the Rio Palena. For non-fishing days Eleven’s experience managers can arrange horseback riding and hiking in the Andes, sightseeing picnics, cooking classes, wine tasting or a relaxing massage at the lodge. The season runs from December to April. During the early season the lack of run-off means the rivers are crystal clear. January and February are the prime summer months with warm days and excellent dry fly-fishing. Rates at Rio Palena start from $7,350 per person based on 2 people sharing for 8 nights. The price includes one night in Puerto Varas, 6 days of guided fishing, one-day of heli-fishing, all fishing equipment and flies, fishing licenses, pre-arrival planning, breakfast, lunch, apres and dinner, house alcoholic and non-alcoholic drinks, laundry service and round-trip transfers from Palena Airfield. Rio Palena is located in the Northern Aysen region of Chilean Patagonia. To get to Rio Palena Lodge from the UK guests fly to Santiago (14.5 hours), followed by two internal flights – from Santiago to Puerto Montt (1 hour 45 mins) with an overnight stay in Puerto Montt/Puerto Varas. Guests then take a charter flight from Puerto Montt to Alta Palena Airport (I hour 15 minutes), followed by a 20-minute drive to the lodge. A commercial flight option is available from Puerto Montt to Chaiten (35 minutes). Rio Palena Lodge is a 3-hour drive from Chaiten. Alternatively, guests can charter a private plane from Santiago to Palena Airfield (3 hours), followed by a 20-minute drive to the lodge.